"We're adding a dog to Call of Duty," they said. "It'll be really cool." And we assumed they meant it; we assumed the dog would be cool. Little did we know the dog would be this cool. But for a few glorious seconds, it transcends all that boring human drama. 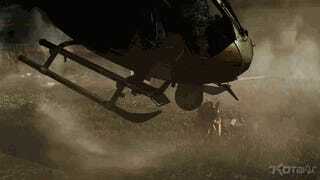 For a few glorious seconds, Call of Duty Dog turns up and TAKES DOWN A MOTHERFUCKIN HELICOPTER. This is so awesome that I'm going to slightly alter my stance on Call of Duty Dog dying in this game. If some bad guy kills the dog just to score Emotion Points and make us hate him, then the people making this game are hacky jerks. But this new clip, immortalized in GIF form up top, has me reconsidering Call of Duty Dog's capabilities. I mean, if Call of Duty Dog dies while, say, piloting a jet carrying a nuclear bomb far out over the Pacific Ocean in order to detonate it a safe distance from Los Angeles… I mean, it'll be a tragedy, but a noble one. I will salute Call of Duty Dog, but I will not mourn for him. While making the above GIF, Chris pointed out to me that this is actually the second bit of canine wartime badassery we've seen in the last 24 hours. 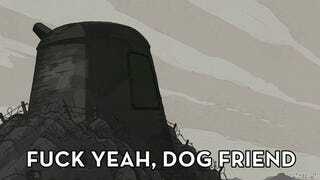 The first being this clip from Ubisoft's just-announced Valiant Hearts. Okay, I still have to flesh out the finer points. But you gotta admit, the raw materials are solid gold.